To give a little background here, this class began their 5th grade year with a bit of a reputation. There are 15 strong-willed, rambunctious, inquisitive, competitive boys (mine being one of them) and only 7 girls in the class. Previous teachers had gotten worn down and exhausted by mid-year — they are definitely a handful (I want to be clear, we’ve loved each and everyone of their teachers). Then came Mrs. Hammerton. She was tough but fun. Strict but silly. Demanding but compassionate. She expected a lot from every single one of her “Angels.” She got results and and inspired them everyday. And they loved her for it. 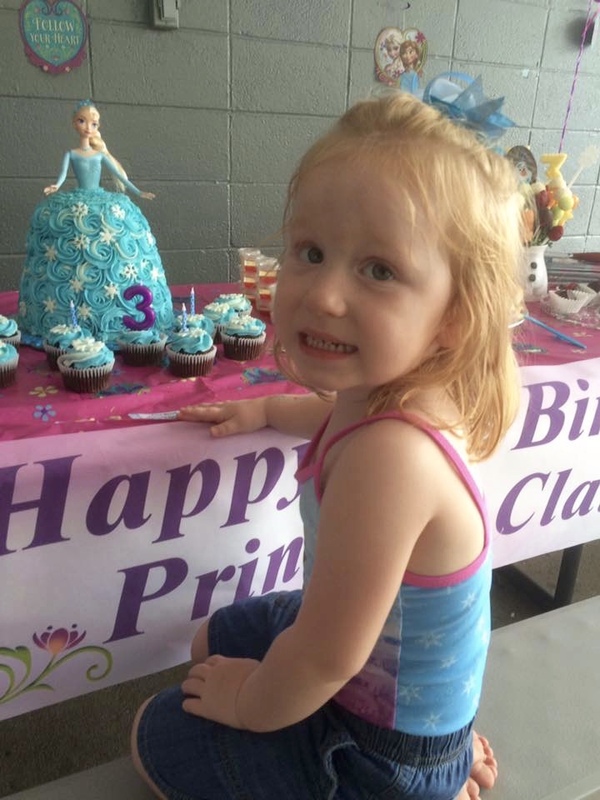 On the day before school let out, we surprised her with this cake, ice cream, and an angel bracelet and poem. We wanted her to always remember her “Little Angels.” We also had enough donations from parents to get her a really nice gift card! For ease of serving, it’s a cupcake cake made from 24 chocolate and vanilla cupcakes, iced all together to look like a cake. I wanted it to look like a piece of lined paper with doodles and the simply drawn image of an angel. The angel is actually an icing transfer made by piping layers of icing onto waxed paper in the shape of an angel (the elements nearest you go down first, layering until it’s all filled in). After freezing for a few minutes, the waxed paper can be peeled away and the image carefully laid onto the cake. Congrats for making it through 5th grade, kids, and thanks so much to Mrs. Hammerton for being an inspiration and Guiding Angel to all of us! We love you, Mrs. Hammerton!! The foundation was formed in memory of Michael Hirschbeck, son of major league baseball umpire John and Denise Hirschbeck, who lost his battle with Adrenoleukodystrophy (ALD) on April 8, 2014. The mission of the Magic of Michael Foundation is to inspire, empower and provide hope to families enduring the “curve balls” of life. I made these cookies for their 2nd annual dinner and golf outing, a fundraiser for various causes important to the Hirschbeck family. Thanks so much, Michelle, for asking me to be a part of this wonderful event! 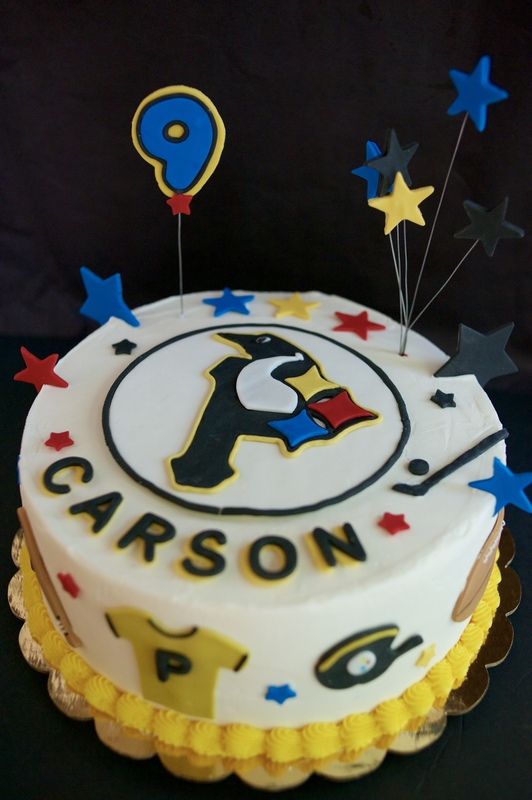 Made this sports-themed cake for a sweet young boy who was turning 9 and loves all things sport in Pittsburgh! I used a neat trick I found here on Cake Central to imprint the tri-sport logo onto fondant and then cut it out with an exact-o knife (watch the tutorial, it shows how to use royal icing to make a transfer). This is such a cool technique to transfer about any image you have to fondant and it’s pretty easy and quick. I used my clay extruder to make the yellow border around the “P” and the black border around the white disc. The letters, stars, jersey and other sports images are cut from homemade marshmallow fondant using this cutter set from Cake Boss. I hand cut the hockey stick as I had no cutter for that (can’t you tell…). The cake was a 10″ round double-chocolate with chocolate mousse filling and iced with vanilla buttercream. All of the details were cut from homemade marshmallow fondant. Happy birthday, Carson! I really enjoyed making your cake! I must say, this was an unusual request…A lovely lady contacted me via my FB page and asked if I could make a cookie that represented a Nat’l Geographic magazine cover and one that was a world globe. “Of course,” I said, “Sure, I can do anything on a cookie” (yeah, right). Luckily she wasn’t too specific on the cover details, she just wanted it to be recognizable as a magazine cover. So I did some research to figure out what I could do using royal icing to make the cookie look as similar as possible to one of the actual magazine covers. I found a cover story about black holes and that was all I needed. Starting with the iconic yellow border and using the wet-on-wet icing method, I was able to make the cookie look similar to the cover. I did change the letter color to white as my white royal icing at the time was a better consistency for fine detail piping. The globe cookies were fairly easy and fun…although the land masses aren’t exact (all you geography geeks out there, please don’t be too critical!). I thought the little jets were a fun touch. When I finally met Megan (the sweet young lady who ordered the cookies), she explained that they were for a book club party she was hosting. The feature book was “A House in the Sky” by Amanda Linkhout, a memoir about a young girl who escaped a violent household by paging through issues of National Geographic and imagining herself visiting its exotic locales. It’s definitely next on my “to read” list! Thanks for the challenging and fun cookie order, Megan…I always love when I’m asked to create something different and unique!